We've seen GPS lead people into some ridiculous situations, but we never thought anyone would blindly follow GPS until their car was submerged in A BODY OF WATER. Three Japanese tourists proved us wrong! According to the Brisbane Times, the unfortunate trio was forced to abandon their rental car in the drink yesterday morning off the coast of Australia. The trio wanted to take a nice day trip to North Stradbroke Island. Their faith in GPS proved to be a costly mistake. The Tokyo students had wanted to take a day trip to Straddie and believed their GPS unit would be able to guide them there. 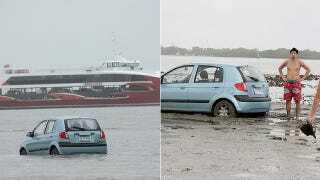 The GPS forgot to mention the 15 kilometres of water and mud between the mainland and the island. Yuzu Noda, 21, said she was listening to the GPS and "it told us we could drive down there. It kept saying it would navigate us to a road. We got stuck . . . there's lots of mud." Yuzu and and her travel friends Tomonari Saeki, 22, and Keita Osada, 21, were all looking forward to a day trip to the island, but headed back to the Gold Coast courtesy of a lift from the RACQ tow truck driver who was called to the stranded car.